Steel bars, evil inmates, perhaps a sympathetic prison guard, and an innocent (or not so innocent) man. Classic ingredients of a great prison flick, and they can be made even better with a good prison bust. See if you can track these cons and their tricky prison-flick related questions. 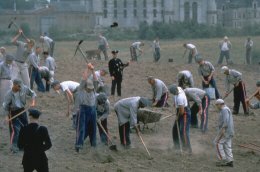 1) How do Sly Stallone and the boys finally escape in 1981's WWII soccer/prison of war flick "Victory"? 6) What mean thing DOESN'T the guard with the politician uncle do in the Oscar contender "The Green Mile"? 2) What proof do the prisoner's on Manhattan island send the outside authorities to show they have the president in "Escape From New York"? 7) What does Van Damme's 1990 prison flick "Death Warrant" have in common with Stallone's 1989 prison flick "Lock Up"? 3) What method DOESN'T Eddie Murphy or Martin Lawerence try to bust out of theiur prison work camp in last year's flick "Life"? 8) What does the old painter guy do in "Escape From Alcatraz" when the warden takes away his painting priveliges? 4) What's the town that Tim Robbins tells Morgan Freeman he plans to go to if he gets out of prison in "The Shawshank Redemption"? 9) Why do Gene Wilder nad Richard Pryor go to prison in Stir Crazy? 5) What bet does Paul Newman take on in his work farm - prison , just to pass time, in the oldie but goodie "Cool Hand Luke"? 10) A toughie. What flick is this pic from? 11-14) Cruel and Unusual Punishment Matchup!